Watch the pros work while you dine. An experience unlike any other.. Hot Rods stokes your muscle car flames. Pull up a stool and enjoy, we insist. Hotrods Old Vail is Greater Tucson’s only racing themed bar and restaurant. Bring the kids and watch motor legends come to life through the expansive garage bay windows. Buick, Ford, Chevrolet, International and more. Working restorations and automotive masterpieces taking shape before your eyes. Satisfy your motor head and your appetite in a place like no other. Take your taste buds to the open road with the satisfying, old fashioned comfort foods from the diners of the days past. Enjoy our delicious menu of barbecue, sandwiches, pizza, pasta, and make your own burgers. We offer fantastic dining specials during the UofA football season and regular football season. Join us for food & drink specials every game day, all season long! Registration 8-10am & show and shine from 10am - 2pm. 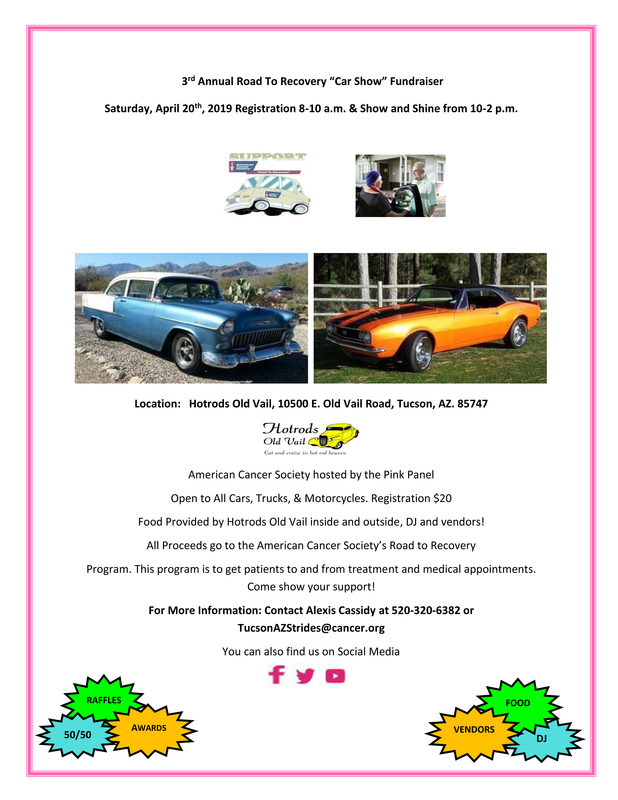 This car show fundraiser is to help raise money for American Cancer Society's Road to Recovery Program. This program is to get patients to and from treatment and medical appointments. Open to all cars, trucks, and motorcycles. $20 registration fee with all proceeds going to the program. Food provided by Hotrods Old Vail inside and outside, DJ and vendors. Raffles, 50/50 and Awards. Come show your support! 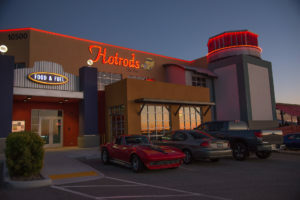 Larry H. Miller presents Mopars at Hotrods. An eventful evening for all you Mopar lovers and car enthusiasts of all sorts. 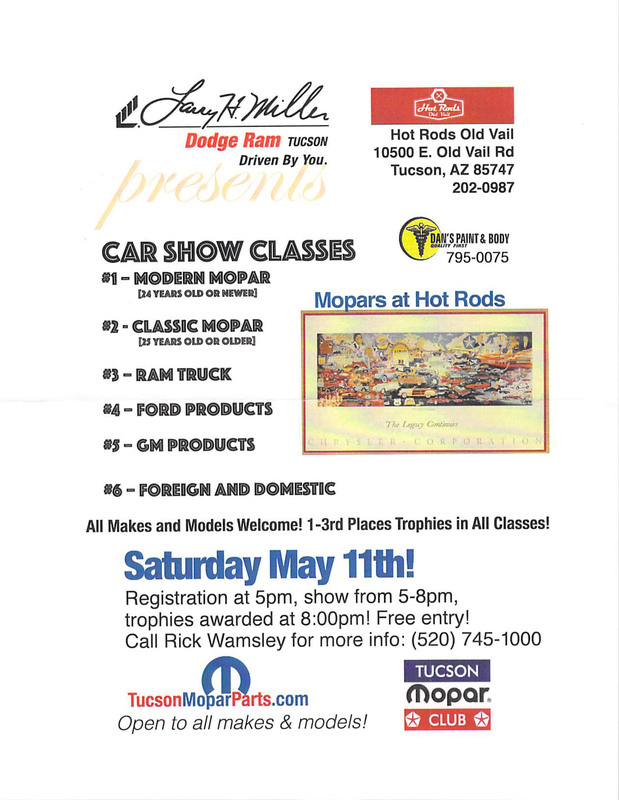 Trophy classes include Modern Mopar, Classic Mopar, Ram Truck, Ford Products, GM Products and Foreign and Domestic. 1st-3rd place trophies in all classes. Registration begins at 5pm, show from 5-8pm and trophies awarded at 8:00pm. So what is Hotrods all about? The open road in front of you, full of opportunity and adventure. The hum of eight cylinders under the hood. With each passing mile, the bond between man and machine grows. Hotrods Old Vail, it's kind of like that.